The Sinai Rehabilitation Center is celebrating 50 years of providing quality physical medicine and rehabilitative care to the Baltimore community! We treat patients of all ages, from infants to the elderly, across all medical disciplines so they may return to their community with competent, confident independence. and to minimize the time it takes to return to daily activity. We offer the full spectrum of acute and subacute rehabilitation care on both an inpatient and outpatient basis. 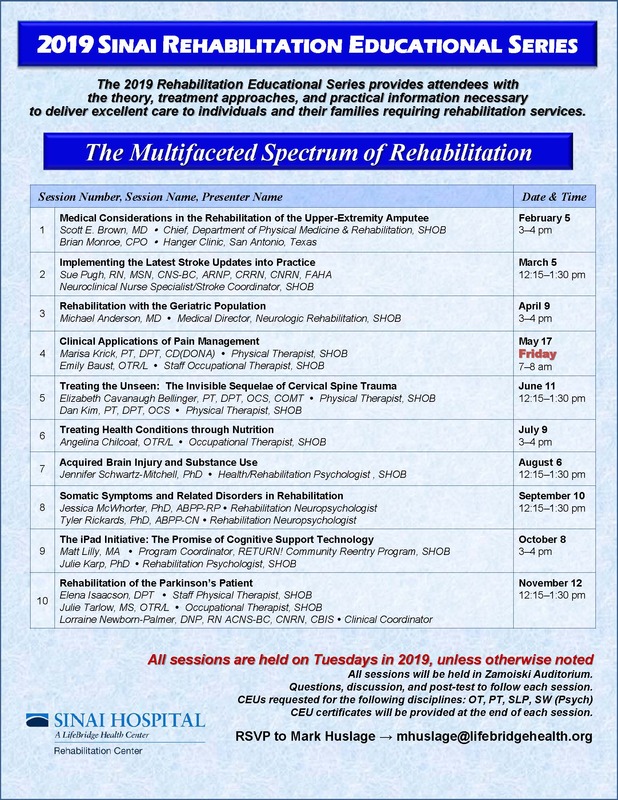 Specific services include traumatic brain injury and neurological inpatient rehab; cardiac rehab; stroke rehab; pain management; aquatic, physical, occupational, and speech-language and swallow therapy; women's rehabilitation services; driving evaluations; RETURN! to work programs; and much more. In order to best accomplish our rehabilitation goals, we offer our patients the full continuum of care in one establishment. From day one in the general hospital (acute care), the patient may experience a broad range of therapy services. When rehabilitation is required after discharge, outpatient therapy needs can be well addressed with Sinai's many specialized programs. The inpatient rehabilitation units are accredited by The Joint Commission and the Commission of Accreditation of Rehabilitation Facilities.